We are changing accounting systems, and do not/will not use the integration w/the platform. All of my tag names/levels are staying the same, but the GL codes associated with them need to change, for every tag option that we have. The only way I've been able to update this in the past was to re-import the entire file; but I need to know how this will impact my existing reports. Will it replace the options on all approved & reimbursed expense reports? (ie when I export the data from those reports, will it keep the original tag GL, or show the new tag GL? 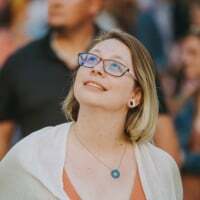 Hi @JT_CCS, thanks for posting to the Community! I checked your account and see that all of your policies are connected to an accounting integration, and all of your Categories are being imported directly from that integration. 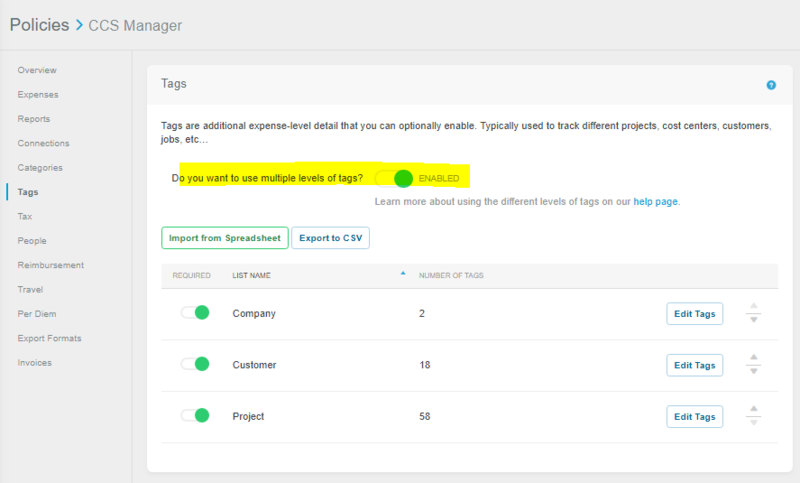 Please note that if you disconnect your policies from your accounting integration your categories and tags will no longer be displayed in your account to be chosen, and you will need manually import them moving forward. If users already selected those categories and tags in the past and submitted the reports, nothing will change on those reports, the categories and tags will remain the same. The changes will only be applied to Open reports and new expenses moving forward. Our policies are NOT connected to an accounting integration. I'm not changing the 'names' of the tags, just the GL codes associated with them. Will that only change the 'open' and future expenses? So I'm going to have to manually modify post-export to get everything from January coded properly before I import the JEs to my accounting software? Hey @JT_CCS, sorry for my confusion here! I quickly checked your account and Categories tab and assumed that your GL codes were being imported from an accounting integration. My bad! That's correct, the changes will impact the open expenses and reports, and the new expenses moving forward. Everything that was already submitted and is listed as Processing, Approved, Reimbursed is locked with the old codes and tags, and will not be affected by those changes. So there is no way for me to 'back-date' any expenses with a transaction date of 1/1/19 to use the new codes? ...Unless I manually change them after exporting the data? Okay - I just re-imported the tags using the same DEPENDENT with GL Codes file ... NONE OF MY DEPENDENCIES ARE WORKING. There are 3 sets of tags, Company, Customer, and Project. The Customer and Project tags list is showing ALL OPTIONS even though its supposed to be dependent. Hi @JT_CCS, thanks for sharing that file. I tested the upload and experienced the same thing you did, but then I noticed that you had sent me an xlsx file, which isn't one of the supported multi-level tag formats. When I converted the file to CSV and uploaded it using the below settings, I was able to see the dependencies worked as expected. I attached the xls file because your forum doesn't allow me to attach the CSV. It also doesn't accept an XLS file format. SO, it's not my file. And if I re-import it again; won't I have to go through the same 're-application' of all tags in all open and pending reports that i just spent the last 3 hours doing? 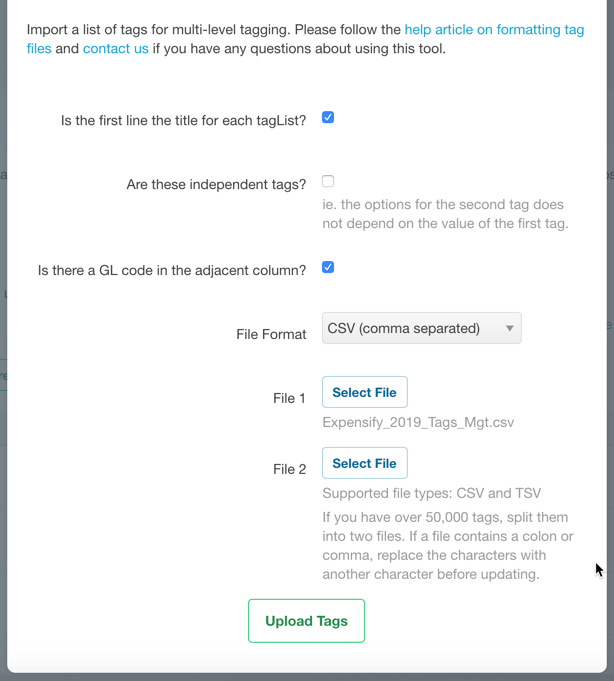 @JT_CCS Because you are moving from independent tags back to dependent tags, you will need to retag your expenses for them to show as in policy. If the current tags are correct, however, and your export will work with your accounting software, you should be able to leave your current expenses tagged as they are. I'm NOT moving from independent tags to dependent tags. The file is exactly the same as I shared to you; and it's the dependent tag template. Using multiple levels is enabled. Because the last file was incorrectly loaded as independent tags, it broke your dependencies. From a technical standpoint, your policy is moving from independent tags to dependent tags even though it's the same file.